bellputtersmfg has no other items for sale. 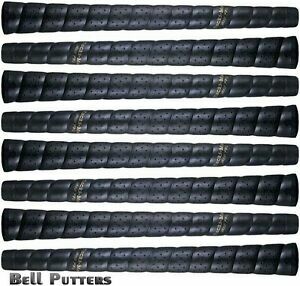 Details about Eight (8) Tacki-mac Perforated Tour Pro Wrap Midsize Mid Black Golf Grips +1/16"
Eight (8) Tacki-mac Perforated Tour Pro Wrap Midsize Mid Black Golf Grips +1/16"
There are 961 items available. Please enter a number less than or equal to 961. Warranty: Our products come with a one year warranty for materials and workmanship defects. We will repair or replace any equipment deemed faulty or defective at no charge to the customer. Bell Putters is not responsible for damage that occurs to any product as a result of abuse, improper storage or poor swing mechanics. Pleased with the purchase, and the fast shipping. Highly recommend this seller. I've used these grips before and they are good grips at a good price. They get a little slippery after several months but cleaning with a soap or good cleaner brings the sticky feel back. Good grips. Tacky but not sticky.